The National Hispanic Cultural Center in Albuquerque , for much of 2018, has been celebrating Rudolfo Anaya's novel, Bless Me, Ultima, with various events such as an elaborate art exhibit and, in October, a marathon reading of the book by numerous people. If you find yourself in Anaya's hometown, I'm sure a trip to the Center would be rewarding. Here are the details that I know about what the Center is doing to honor Ultima's forty-sixth anniversary. Featured artists include: Jesús "Cimi" Alvarado, George C’de Baca, Sylvia Ortiz Domney, Christian Michael Gallegos, Roberto Gallegos, Eric Garcia, Kristina Gonzales, Nacho Jaramillo, Al Na’ir Lara, Chisim Bernal Lujan, Oscar Lozoya, Chris Ray Melendez, El Moisés, Derrick Montez, Paloma Paz Nava, Gabriel Luis Powers, Chris Rivera, Rebecca H. Hernandez Rosser, and Catalina Salinas. The following is from Valerie Martínez, Director, History and Literary Arts/NHCC, and Chamizal MacPherson. The National Hispanic Cultural Center would like to invite you to participate in a special event to celebrate the 46th anniversary of the publication of Rudolfo Anaya’s Bless Me, Ultima. On Saturday, October 14, 2018 we will present a beginning-to-end reading of the novel in our art museum, where an exhibit about the novel has opened. This exhibit will be open through November 11, 2018. Dignitaries, luminaries, New Mexico writers, Anaya family members, NHCC patrons and community members are invited to read from the novel, each for 15 minutes during this day-long event. PREP: None at all; you will simply take the podium and read from the novel where the previous reader has paused. Regular or large print text will be available. As you may know, the NHCC has been celebrating Bless Me, Ultima since our exhibit opened in March of this year. 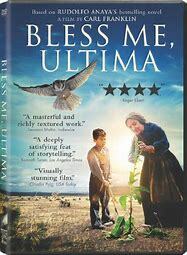 This year-long celebration culminates with this October reading and a second showing of the film “Bless Me, Ultima” on Thursday, November 8, 2018. For participating we will provide a breakfast, lunch and lite dinner fare. Each reader will receive a special gift for participating. Congratulations to señor Anaya and the lasting power of his revered literary classic. We at La Bloga wish him all the best and hope to read his "new stuff" for years to come.